…but dynamism is not the only worthy quality in dance. 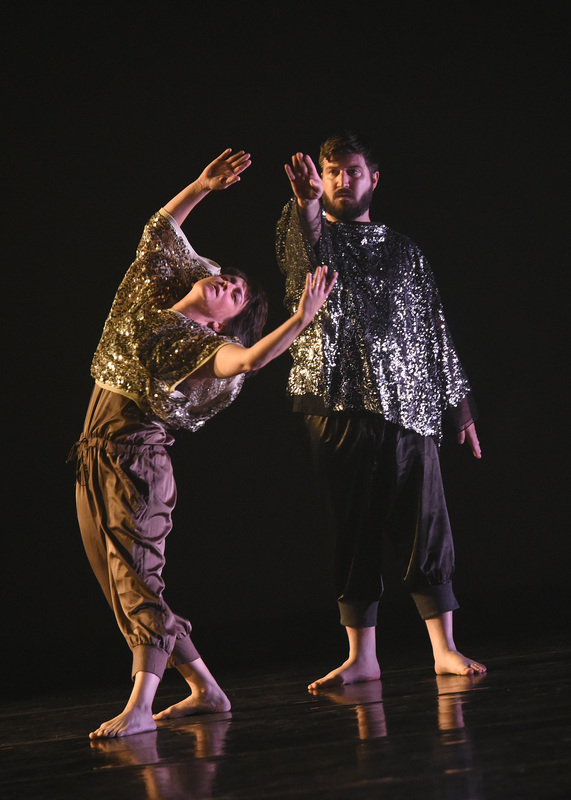 As the 2015 American Dance Festival continues this week with four commissioned duets by paired choreographer/dancers, it offers us a chance to not only see new work unfettered by economic constraints, but to consider what we value in dance art. Whether we value any particular style or content in these new works, we ought to all value the fact that artists have been able to make them thanks to the support of the ADF. Last year, the ADF commissioned solos; this year duos–perhaps next year it will be trios. 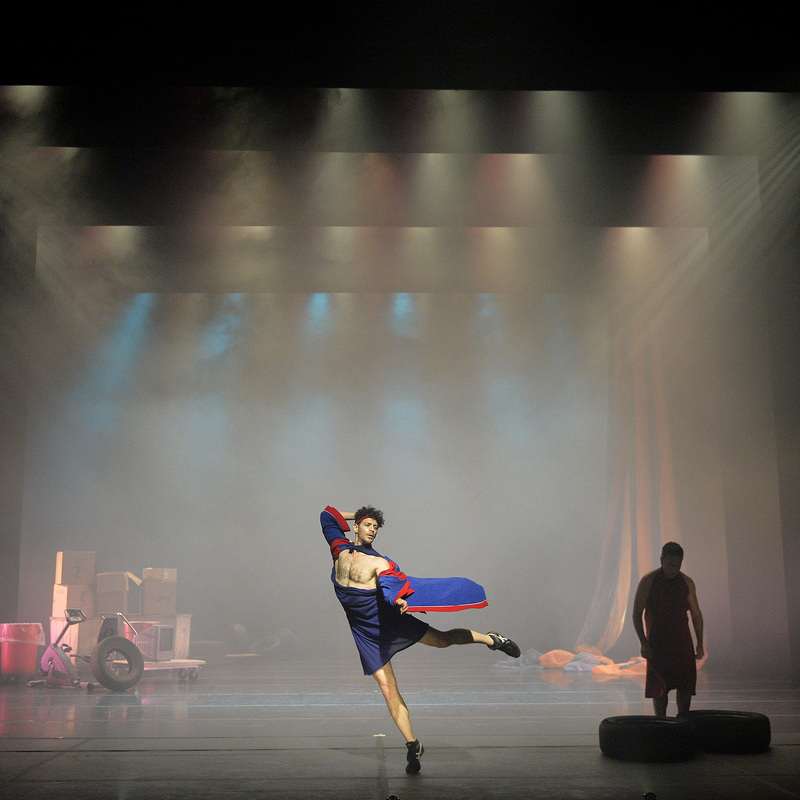 The Dynamic Duos program opened last night in Reynolds Theater, and will run through July 1. Jesse Zaritt, front, and Mark Haim premiered their Golden Age at ADF on 6/29/15. Photo: Grant Halverson. I, for instance, greatly prefer dancing to talking in a dance work. Yet sometimes choreographers are able to introduce talking in ways that do not cancel out the communicativeness of the silent, speaking bodies, and combining the forms increases expressive power of both. Sometimes, though, more is less. The program opens with a strange and wonderful work, Golden Age, by Mark Haim and Jesse Zaritt, that evokes superheroes–and Caravaggio. Roman ruins–and the city dump. The now–and the mist-shrouded past. It remarks on ever-ascendant youth, flaunting its glories over sturdy age. Mostly it manages this without words, relying instead on Zaritt’s beautiful dancing body, limber and exuberant, and Haim’s graceful, certain elegance of motion. Which age is golden, young or older, now or past? I’d see this again, except for the brutal after-effects of the heavy theatrical haze (that makes such wonderful stage pictures). More than 12 hours later, my eyes, throat and lungs still burn. Fortunately, Golden Age is highly memorable. The same could not be said Taryn Griggs’ and Chris Yon’s Conspicuous Birds. The two dancers mimic various bird behaviors, while wearing fabulously glittering, wing-sleeved tops over dark pants (costumes by Tiny Yogg’s Ma). The lighting plays marvelously on the fabrics as the dancers move. Clearly, they have closely observed many species of birds, and many of the movement patterns are true and charming. The problem is, the movement doesn’t vary much, but it goes on for a long time. And nothing really happens, dramatically speaking. Taryn Griggs, L, and Chris Yon in the premiere of Conspicuous Birds at ADF 6/29/15. Photo: Grant Halverson. After a rousing start with the Overture to Rossini’s The Barber of Seville, Small Stories fell silent. Claire Porter and Sarah Juli stood far downstage, one on either side, in satin recital gowns, alternately mouthing words as a single spot alternately separated them from the darkness. The effect was similar to a flashing ad on a web page–very irritating. Eventually the volume increases to audible, but the language remains fragmentary a while longer before actual sentences emerge. After that, the experience is like catching bits of conversation in a moving crowd, or like listening to chickens cluck and fuss while pecking for food. When it got to the stage of the movement artists mockingly mouthing the words to “Che Gelida Manina,” (Pavarotti version) and for no apparent reason pulling up their petticoats to reveal red underpants, my across-the-aisle neighbor (a man renowned for both his courtesy and his passion for music) abruptly decamped. There was nothing I valued in this piece, except for the fact that the makers had had the opportunity to try something. 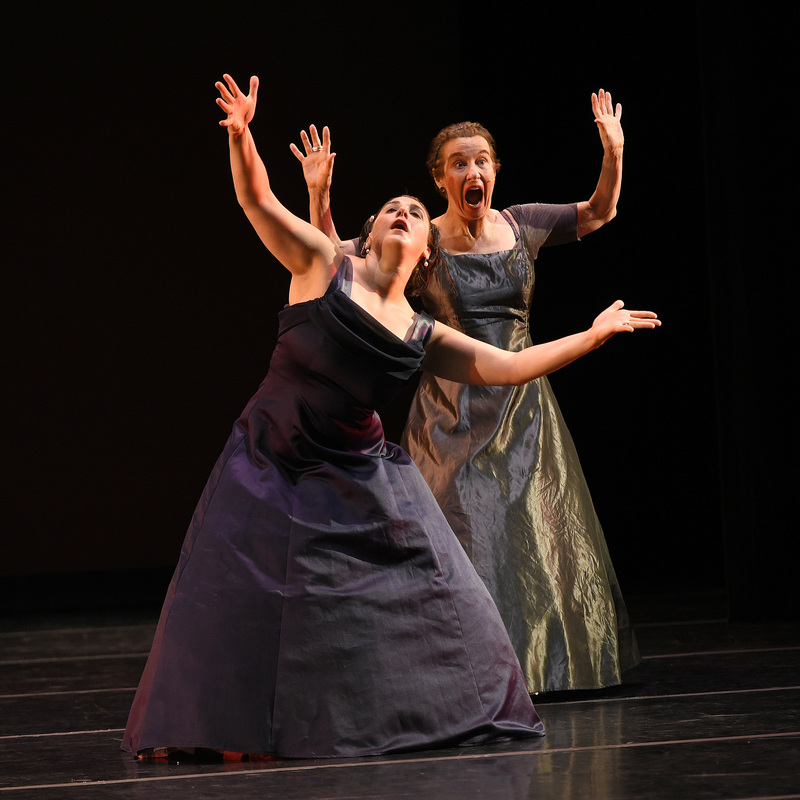 Sara Juli, front, and Claire Porter in the premiere of their Small Stories at ADF 6/29/15. Photo: Grant Halverson. I had to stay, because I had to see what Rosie Herrera and Larry Keigwin had gotten up to together. These two are wacky, brilliant and skillful on their own–what kind of craziness would they make together? Something Wonderful has some pretty wonderful moments, and the piece begins with dancing. Larry Keigwin can move! Such a pleasure to see him again. And Rosie Herrera has an unerring instinct for both motion and stillness, and knows just where to slice with her scalpel, dramatically speaking, so that we can see the forces at work on the human heart. There’s a bit with a poem and a microphone (a little too long) that makes the analogy (perhaps too clearly) between the art-making process and the love-making endeavor that’s so smart and funny that one easily forgives its slight self-indulgence. Bruised, broken, bloodied but unbowed, these artists, tangled up in art, will dance on. In this case, dynamically. Larry Keigwin and Rosie Herrera in the premiere of Something Wonderful at ADF 6/29/15. Photo: Grant Halverson. A Keigwin + Company dancer, gorgeously kinetic. Photo by Matthew Murphy, courtesy of ADF. Larry Keigwin could probably power an entire city with the energy generated and released during his dances, five of which comprise the program for Keigwin + Company’s three-night run in Reynolds Theater as the American Dance Festival continues. For Tuesday’s opener, the theater was well-filled with ADF students, whose enthusiasm gave energy for energy, and raised the already high sound level. Keigwin has a penchant for loud music with a driving beat; occasionally the thought occurs that it could drive one right out of the theater. The program opens with 12 Chairs, from 2012. Its dozen dancers, working with folding chairs, display clearly Keigwin’s continuing interest in patterned repetition, as does the music, Flexus, by Jonathan Melville Pratt. The dancers, with magnificent physiques and skills to match, wear casual work-out clothes, mostly drab, with the exception of three bright red clothing items. The red bits highlight the shifting patterns and alliances in a very interesting way. Although this is not a musical chairs game, where one player will be left out at the end, still it embodies much competition. I found its combination of aggression and ennui distasteful, and did not see anything really fresh in the choreography. At this point, I’ve seen quite a few pieces in which the dancers hop up on folding chairs, proving their aim, balance and confidence in their own invincibility. Trio (2011) powers on with more relentless beats and repeating phrases (No. 6 for Piano, Marimba, Cello, Violin, by Adam Crystal), and with fewer dancers and much more uncluttered space, both their grace and Keigwin’s concerns are clearer. Trio depends on one of Keigwin’s tropes I find particularly irritating—whiplash fast reversals. Seldom does he allow a long flowing sequence in one direction. Still, he does build segments out of these self-mirroring bits, and these sometimes repeat in reverse, which is much more intriguing. There is a great deal of walking or running circles, but there is also some great dancing in Trio: beautiful, daring weight transfers as energy flow is reversed; some very fine spins and lifts. Oddly, although the two men were near her size and she was clearly equal to the task, never did the female dancer lift either of the males on Tuesday night. Natural Selection, which the ADF commissioned in 2004, is set to yet more driving music, Weather One, by Michael Gordon. Long-time festival-goers may remember this work: it was the subject of an adulatory feature by former News & Observer dance critic Linda Belans, before in premiered in Reynolds in 2004. She was very taken by Keigwin’s use of the back wall: he deepens the stage space by removing all the back drops, and allows for movement up the wall in a novel way. But before we see that, we get a parade of arm-swinging Neanderthals, and a great deal of aggressive, even angry, chasing, grabbing, throwing (many bodies hit the floor), flinging and dragging, set to music raging hard and fast, loud and louder. Eventually, the dancers form and travel through a tunnel of time extending across the downstage floor. She who successfully evolves walks upright, if sideways, across the back wall after climbing over all her companions. A new work commissioned by the ADF this year opens the program’s second half. Contact Sport features four male dancers in white shirts, ties, and snug gray pants or shorts. I thought they were prep school boys, but they are meant to be brothers. The quick-reversing patterns continue, along a theme-line of adolescent physical gags and rough-housing, but the music is a surprise—a medley of wonderful old songs, sung by Eartha Kitt in her wise old voice. The pairing of that experienced voice and the youth of the characters is delicious. As you may have gathered, Keigwin is not my favorite choreographer. He irritates me, so I’m always looking for a nice big pearl as the pay-off. The night’s final offering paid up. First of all, Megalopolis (2009) is set to music that doesn’t beat you up: Steve Reich’s Sextet—Six Marimbas, along with excerpts from MIA’s World Town and XR2. Reich’s music is of course made of repeating patterns, but it doesn’t turn on itself, instead going on in long marches toward infinity. The dance in Megalopolis does the same, and without the jitter and fracture, gorgeousness appears. The dozen dancers are clothed here in outrageous black or silver bodysuits (by Fritz Masten) sparkling with swathes of crystals. Some have insect wing-like additions on the shoulders, some have thick stripes of sparkle down their backs or across their chests. As the sleek creatures criss-cross the stage, vamping and waving their antennae, you may giggle with delight.